Our new favourite way to cook steak. This is delicious and there’s no need to splash out on an expensive cut. 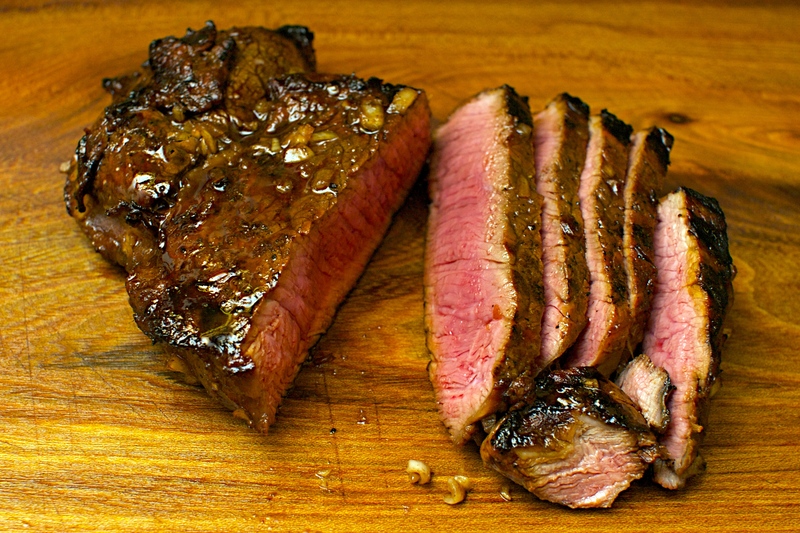 We’ve been using rump steak but it will also work really well with skirt steak if you can find it. You’ll need to cook skirt for a bit longer though. Put the beef in a wide shallow dish and rub it all over with the shallots and balsamic vinegar. Season and leave to marinate for 20 minutes. Make sure your barbecue or grill is really hot before starting to cook. Barbecue (or grill) the beef for 3-4 minutes on each side, depending on how thick it is. Take off the barbecue and cover with foil for 5 minutes, then slice thinly across the grain and serve with the meat juices. Add a drizzle of olive oil and balsamic vinegar if you like. Serve with potatoes roasted with rosemary and garlic. Wine Suggestion: Try a Tuscan red from Bolgheri or the Maremma which will give you a nice juiciness but still maintain the depth of structure and tannin needed to work with the steak. I’m definitely trying this! Never thought to do so before reading your post. Thank you from Charlotte, North Carolina (USA)!